High quality video lessons that will guide you from your first time on snow right through to introducing a parallel turn. Looking at the equipment, straight runs, snowplough, turning and more. Stunning video, intuitive cue cards and engaging presentation will enhance your learning experience and give you the skills to feel confident and in control. NOTE: - The audio issues mentioned are only due to the mute settings. Please check your mute switch first or if its an iPad double click the home button and scroll the bottom menu bar from left to right. Look for the silver speaker icon and remove the mute setting. Still not working then give us a shout. These carefully designed lessons will: • Complement on-slope tuition with a qualified instructor • Clarify the basics • Give you a head start and get you skiing in control Best of all it’s portable and can be used anywhere: • In the chalet before a day out • As a handy reminder on the lift between runs • On the bus, train or plane before heading out to the mountains Once purchased, upload the app with everything included, no further uploads or costly data charges while you’re away. Just grab your phone and hit the slopes. 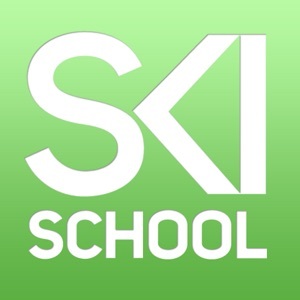 So get Ski School Beginners App now and join Darren Turner on his quest to make you a better skier.